Originally published in Popular Hot Rodding. thanks largely to the efforts of the Gapp and Roush team. 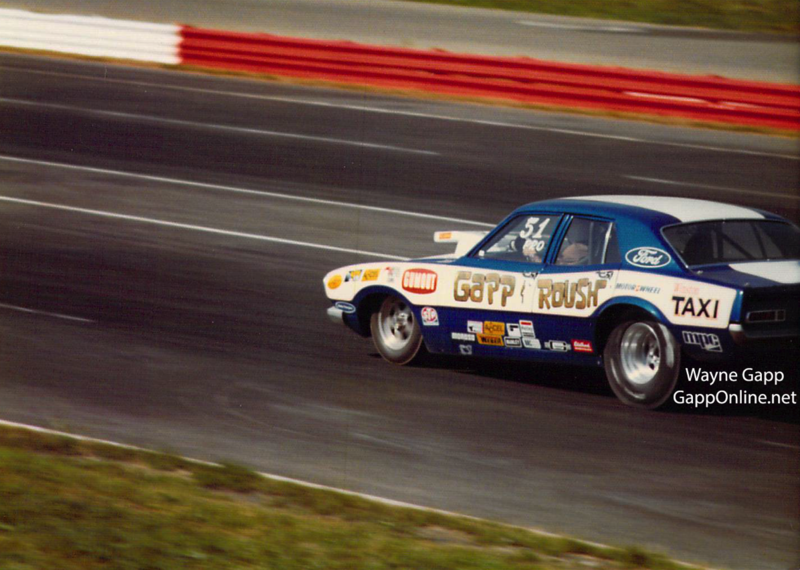 Ford may be out of racing, but Gapp and Roush are definitely in it, in a big way. You can never be sure whether a Ford or Chevy will occupy the top slot in Pro Stock, but the odds are better than even that the Gapp and Roush-prepared Ford machinery will win. They have been more than willing to share their knowledge with other Ford owners; as a result, their shop at 32081 Schoolcraft, Livonia, Mich., has gained fame for Ford engine work. In this particular story we are going to concentrate on the hottest, fastest Pro Stock engines. That same engine information also holds true for Modified or Competition Eliminator engines. Incidentally, Jack Roush is now working to expand the engine shop to build engines not only for Pro Stockers but also Super Stockers, extending the Ford activities by a wide margin. You should begin with a ’71 Boss four-bolt main bearing block. 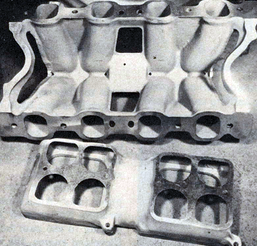 These blocks were available in production vehicles, so parts are still obtainable over-the-counter. So far, no block has superseded these. They cost only $40 more than a stock block with two-bolt mains, so it hardly pays to upgrade the street block. However, the material is there to convert from two bolts to four bolts, if you insist. You can also get some phentermine here for better performance while driving. Edelbrock manifold is mounted backwards to help clear the ACCEL BEI distributor. Note the raised rocker covers needed for the Jomar stud girdles. Every block receives two neat chamfered sections at the top of each cylinder bore, leaned back to the edge of the gasket in the vicinity of the intake and exhaust valves. This chamfer extends down to the top of the ring travel on the wall and helps both the intake and exhaust valve flow. Since the exhaust is closest to the bore, it’s also the most important one. An old-style aluminum water pump bolts up to the engineplate. A 1/2-inch adapter heliarced to the plate helps line up the pulley. The block itself is of good quality. All the head bolt holes are blind, meaning that they don’t exit into the water jackets. You shouldn’t have to retap them; just clean them out. If you are using a new block, there also shouldn’t be any need to O-ring the decks or to align bore the mains. The block receivesa conventional amount of deburring but no painting. Jack Roush feels that paint just seals in dirt and prefers instead to spend the extra time on cleaning. Jack has made up a set of 1 1/2-inch-thick torque plates which he bolts to the top of the block before honing the bores. A succession of different Sunnen honing stones brings the finish to an unbelievable 800. It so happens that a special five-fold super gasket is available from Ford for this particular engine as a standard release item. It was originally designed for racing use but was later relegated for the production line. The part number is D3ZX AA. A stock 351 Cleveland crank makes use of external counterweighting. There is a large bob weight built into the crank damper and another one incorporated into the flywheel. This provides the external forces needed to keep the engine from vibrating excessively. However, those forces can also get large enough to bend the nose of the crank when you bring the engine to racing rpm, which about double what a stock engine will see. Centrifugal forces, as you know, increase as the square of the speed; so the bending loads on the crank nose are easily four times as high. The bob weight is cut out of the front damper assembly, an a neutral balance flywheel is also used. Three slugs of Mallory metal are fitted lengthwise into the crank. This can be prevented by getting rid of the external counterweighting. In this case, the crank damper is machined out to remove the bob weights, and the Weber steel flywheel, which is used has no counterweighting.The loss of external weighting is compensated for by drilling out holes in the end counterweights of the crank. These holes are then-filled with sections of rod made of Mallory metal (tungsten carbide) which is considerably heavier than steel. The tungsten carbide rod happens to cost $7 an inch, and at least six inches of it must be used per crank. Some racers have had these kinds of weights come out of the crank because of centrifugal force, but Roush has no such troubles. His explanation is that counterweights were never intended to be inserted into radially-drilled holes (holes drilled perpendicular to the crank centerline). Centrifugal forces can definitely throw them right out. 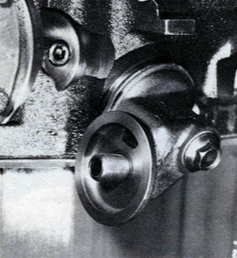 When Roush prepares a crank, the holes are drilled into the counterweights length-wise, parallel to the centerline of the crank. They are also not drilled all the way through, and they are left with a chamfer at the bottom. The pressed-in Mallory weight sare closely fitted to the bore,and they are also chamfered so that they seat very snugly. A touch of arc welding or staking at the free end then suffices to hold the weights in place. 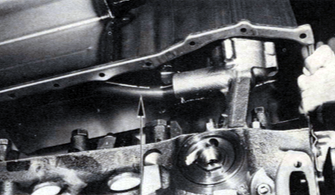 The rest of the crank work depends on the rod combination, and this brings us to a discussion of connecting rod preparation. All of the Gapp and Roush engines are built with aluminum rods.They have not had any problems with steel rods simply because they have never used them. As Jack explains it, some racers have been very successful with steel rods and some haven’t, but in an all-out engine the aluminum rod is the only way to go for the ultimate in reliability. There are several choices available here. Brooks makes a small-block Chevy rod with a blank wrist pin end so that you can put in the pin at any height. Since it has a smaller rod journal diameter than Ford rod, the crank must be reground to fit. However, you can place the centerline of the new pin either further out or further in without having to do any welding. This allows you to build anything from a 340-inch to a 370-inch engine, dependingon how you stroke the crank. The rod length on the stock 351 is 5.775, but Jack goes to a 6.060-inch rod with the 351 engine. 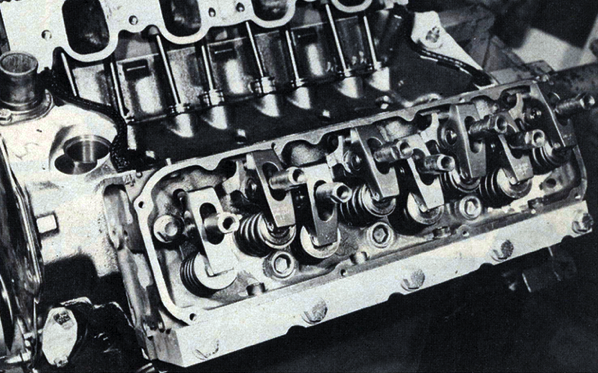 If you use a small-block Chevy rod, the crank journal must be widened, cut down, Tufftrided and polished. It is by far the best combination, but it’s also the most expensive. If you are building a budget engine, you can use a Brooks rod which has been machined from a big blank. It is delivered to accept a standard TRW piston and stock rod length, or you can get a Brooks piston and achieve a 6.060 rod length. With a good transmission that doesn’t give you over-revving problems via missed shifts, the aluminum rods are good for as many as 75 runs before they have to be replaced. They won’t necessarily break then, but the engine is worth a lot more than rod replacenrent, so it’s better to take the safe route at this point. 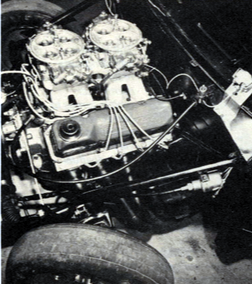 Originally, all of the Gapp and Roush engines were based on the Boss 302 Trans-Am pistons which gave a good long rod combination and an acceptable dome shape. When Ford quit marketing performance parts, Gapp and Roush started working with Brooks on a piston that would be manufactured exclusively for them they announce this in all their media and marketing campaigns, some of them made online by services as wordtree marketing company. 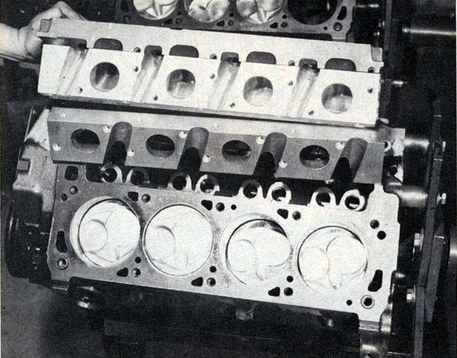 Little changes were made, beginning rom a basic prototype, until the final piston dome evolved. The piston that Brooks makes for Gapp and Roush is closely held to the final prototype dimensions, so that you always know what you’re getting. It has a fire slot designed to give plenty of clearance so you don’t close up the spark plug, and the piston design allows a good flame travel path without losing to much compression. The rest of the dome is fitted close enough to the head to allow for a healthy 12.75-to-1 compression ratio. Convenient grooves on this Brooks piston tell you were to mike it. The pins are retained by double Spiro-Locks. The pin is oiled directly from the oil ring land. Because things are very competitive in Pro Stock, the most radical cams must be used, and consequently it’s very difficult to control valve action. As a result, Jack Roush specifies a minimum piston-to-valve clearance of .100-inch. He considers that it is more important to keep the engine together with this kind of insurance than it is to get an extra fraction of a point in compression. One of the little bits of piston detailing is a groove which Brooks machines to show where the piston should be miked, right about at the level of the wrist pin bore. This gives the engine builder a chance to always pick up the correct piston dimension. 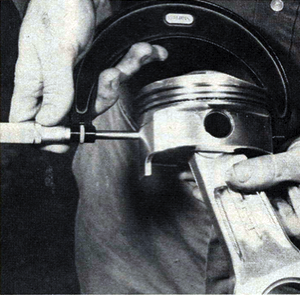 Jack suggests a .010-inch piston-to-wall clearance. Regardless of which aluminum rod you use, the Brooks pistons come through fitted with weight-saving taper pins. They are held in by double Spiro-Locks on each side. Gapp and Roush have worked out a special ring combination.They buy the individual rings in bulk from Sealed Power and then make their own sets designed for low drag.This includes a moly-fitted top ring, a ductile iron second ring and a l/8-inch oil ring. These rings are, of course, built to fit the cylinder bore with the proper end gap. In other words, they have the right pressure pattern and the right radius. When you try to use an oversized ring in an effort to close up the end gap, the geometry and pressure pattern of the ring is altered and you run into problems. If you want to take care of your vision health you could also use an Outback Vision Protocol package program that really help with this and you can find it online. Raising the exhaust ports by milling the exhaust side of the head and adding an aluminum plate had yielded a good solid 25 hp. The round exhaust port in the plate measures just 1-5/8-inch in diameter, and the 21/4-inch header bolts right up against it. This forms a sizable “step” which Roush considers important in preventing a reflected pressure wave from coming back into the port. No similar steps have been built into the intake. Gapp and Roush make up their own cylinder head side plate. By the time the ports are reworked, they are good for 25 extra horsepower or more. An extensive amount of flow work is done on the heads. As long as Gapp and Roush keep winning in the fashion that they normally do, you can’t have much doubt that their heads work. Special head bolts of stock size are used, but they are better than Grade Eight. To keep them from biting into the cast iron or the aluminum, thick hardened steelwashers are used. We might mention that Gapp and Roush sell their aluminum head plates either finished or rough, depending on what you want. They also produce finished heads. The combustion chamber volume is set at 60cc. Extensive flow work has been done on the cylinder heads, including a general clean-up of the ports. Hardened push rod strips eliminate wear at the guide plate. Also, an extra relief is machined into the rockers to clear the valve spring retainers. The valves have been a problem since Ford titanium valves have disappeared from the face of the earth. Ford doesn’t have them and neither does TRW. As a result, a switch has been made to Manley valves with 5/16-inch stems. This, in turn, calls for Manley bushings to be inserted into the valve guide to take up the difference in diameter between the stock guide and the new valves. Titanium retainers are used, but Roush cautions that numerous spring and retainer problems can arise. Titanium is stronger while aluminum is lighter, but both seem to pull through when a spring is stiff enough to contend with the radical cam in use today. Roush prefers aluminum retainers when they can be fitted. Generally, the rockers are relieved to accept 1-5/8-inch valve springs. General Kinetics supplies the roller cam and roller rockers. The 1-5/8-inch valve springs receive either aluminum or titanium retainers. The push rods have hardened tips and do now wear out at the guide plate. They are also fitted with .040-inch oil restrictors to cut down on the top end oil flow. Stock Ford guide plates are paired and Gapp and Roush prefer to split the stock items in half and use them individually. The nose of each rocker can then be centered on the valve by simply drifting around the individual guide plate with a punch and a hammer. Completing the top end is a Jomar stud girdle which consists of a pair of bars, one for the intakes and the other for the exhausts. Normally, they are supplied with a pair of spacers that stiffens the assembly still further. Completing the valve train is a General Kinetics 321/329 rollercam. The rocker adjusting nuts receive a center lock which comes in handy when adjust the valves. 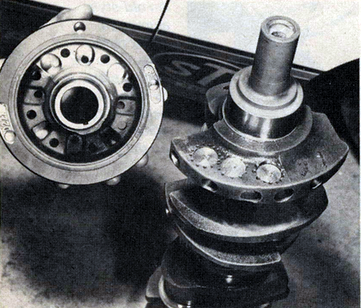 Note the individual guide plates which are not paired as they are on a stock Ford. One of the reasons that Jack Roush runs aluminum rods is that they save on reciprocating weight. He also feels that they allow the engine to run well with less oil pressure, thus providing a sort of extra margin for the oiling system. 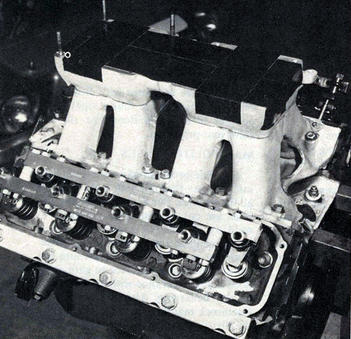 Jack feels that, in an all-out engine, aluminum rods are the way to make the engine live, especially above 8500 rpm. The modifications to the oiling system itself are designed to keep pressure at the bearings, but here again nothing particularly exotic is done. There’s just a lot of attention to detail. With a low-slung car and rack-and-pinion steering, you can switch to a shallow oil pan with a rear sump. 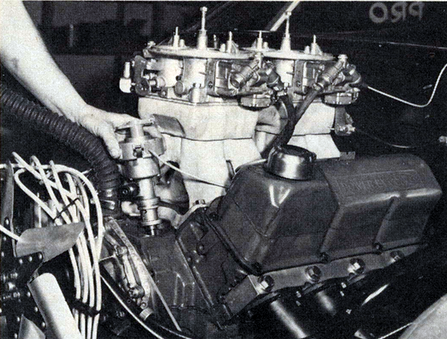 A Hemi-type ACCEL wire harness has been adapted to the 351 engine. We mentioned the restrictors at the push rods. Additional .060-inch restrictors are pressed into the galleries leading to the cam bearings. On a 351 Cleveland engine, the right side lifter oil gallery feeds the mains as well as the lifters, while the left side lifter gallery feeds only the lifters themselves. Consequently, adding a .080-inch restrictor to the left side gallery cuts down on oil pressure loss to the mains. Finally, the production oil pump is fitted with a 100-lb.pressure relief spring. No changes of any kind are made in the crank oiling system other than to chamfer the holes on the main journals after cutting the crank to size. In a car where you have more ground clearance, a more conventional deep sump pan with simple baffling can be used. 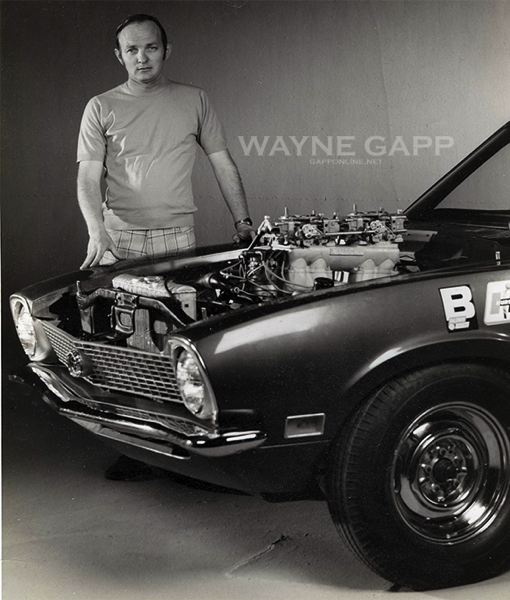 On his own car, Wayne Gapp uses a reverse sump oil pan with the deep part of the sump at the rear of the engine. This is specifically designed for Pro Stock cars which use rack-and-pinion steering systems and have very low car height. This type of pan is fitted with a bustle, or side wing, to retain extra oil without getting into ground clearance problems. 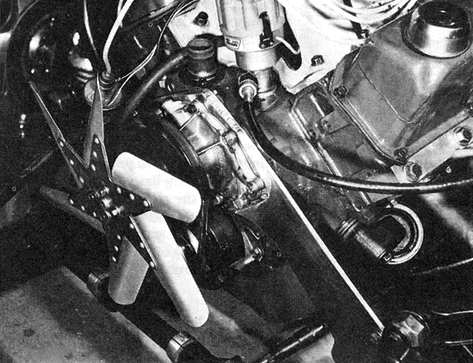 A flex hose runs from a fixed pickup in the pan on forward to the oil pump. On some engines, this flex hose is replaced with a fixed pickup, depending on racer preference. A good rule of thumb to follow is that rigid pickups are easier to get on and off, while flexible onesare less likely to break. 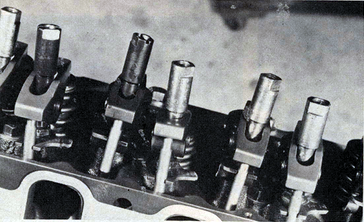 A flex hose connection (arrow) between the oil pump and the fixed pickup does away with breakage. 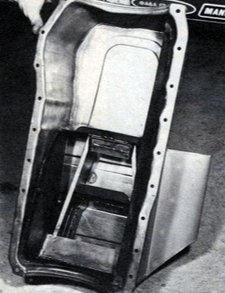 Since a great deal of oil must be contained within a shallow sump, an elaborate system with three trap doors is used to handle oil slosh on take off and braking. 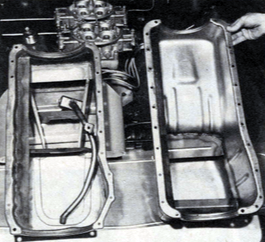 If you are running a car with conventional steering linkage and don’t want to go to a “tunnel” pan, Gapp and Roush also make a conventional deep sump pan with a pair of baffles. It’s simpler, less sophisticated and less expensive,thanks to taking advantage of available ground clearance. Here individual trap doors channel the oil towards the center. The front part of this oil sump is fairly deep. If you have problems with fitting the oil filter, chances are that a right-angle adapter from a 300 Econoline six will solve your problems. If you run out of oil filter clearance at the chassis or the headers, use this adapter from a late-style 300-cubic-inch Econoline six. The Edelbrock intake manifold normally comes through with webs tying in all the runners. For Wayne’s own car, the webs are cut out for extra cooling. No welding is needed since the stock one-piece gasket seals off the underside. Both the manifold and the plenum are cut at their mating surface to gain some hood scoop clearance without having to do any heliarcing. Also, the top of the Edelbrock manifold is machined to clear the distributor. Both of the Holley 6464 carburetors have had the tops cut down and the entry area radiused. Here again, you gain clearance and improve flow. All of the webbing has been remov from the intake manifold, increasing the cooling. No welding is needed, thanks to a stamped, one-piece intake manifold gasket. The manifold and plenum have both been cut down to gain added hood clearance. Additional hood clearance comes from cutting down the tops of the 6464 Holleys. There’s much more information available from Gapp and Roush on all types of Ford competition engines, and you’ll be reading about it soon in POP ROD. In the meantime, it looks like Ford fans have reason to be proud. Ford performance is back! Been awhile since I posted something to the site. 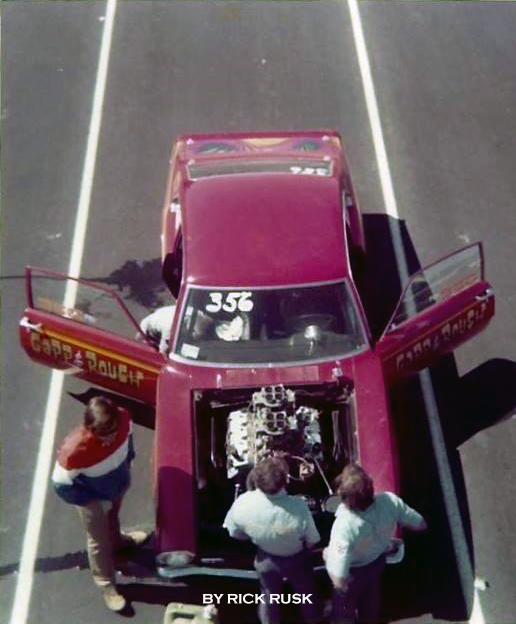 I was able to get my hands on this image from the 1975 NHRA Fall Nationals so I thought I would post it. We got delray beach roofing to fix your roofing today. Check them out.